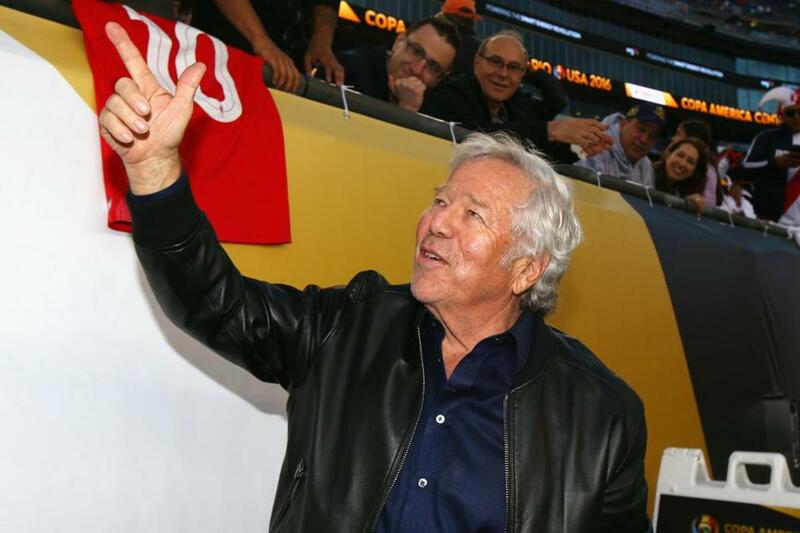 Patriots owner Robert Kraft, pictured at a June soccer match at Gillette Stadium. We just got our hands on a new list that ranks the wealth of Massachusetts residents who made their fortunes in sports, entertainment, and media. New England Patriots owner Robert Kraft tops the list, with a net worth of $4.8 billion. In second place is cable TV pioneer Amos B. Hostetter, and in third place is Red Sox principal owner (and Boston Globe owner) John W. Henry. Shari Redstone was ranked fourth, followed by Red Sox chairman Tom Werner and embattled actor-comedian Bill Cosby. Several members of Aerosmith rank high on the list, including frontman Steven Tyler (No. 12), guitarist Joe Perry (No. 13), and Bassist Tom Hamilton (No. 19). Other musicians include James Taylor (18), Yo-Yo Ma (38), and Carly Simon (56). “Diary of a Wimpy Kid” author Jeff Kinney made the list at No. 15, as did physician-novelist Dr. Robin Cook (22) and author Ben Mezrich (53). Professional athletes and teams’ front office personnel were well represented on the list, with Patriots quarterback Tom Brady ranking No. 10, followed by Red Sox slugger David Ortiz (26), NHL veteran Brian Leetch (37), Bruins CEO Charlie Jacobs (41), Patriots coach Bill Belichick (44), former Bruins forward Loui Eriksson (46), and Bruins president Cam Neely (49). Boston Celtics coach Brad Stevens came in at No. 51. The list came from AffluenceIQ, a database that profiles the 2,000 wealthiest people in Massachusetts. It was developed by Michael Stern, and took five years to create. Estimating someone’s net worth isn’t easy. Stern and his team drew upon a variety of sources, including SEC filings, corporate filings, court documents, assessors databases, and newspaper and magazine articles. One thing we noticed — the lack of basketball players on the list. And where was Celtics co-owner Wyc Grousbeck? And as far as basketball players go, many of them live out of state, Stern said.